Offensive coordinator Troy Walters revealed that freshman wide receiver Miles Jones has had to undergo shoulder surgery, and will miss the rest of the season. Jones had the surgery following the Bethune-Cookman game back on October 27th. Jones had one reception for a gain of 21 yards. He also picked up five yards on his lone carry of the day. 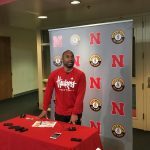 Jones was a three star recruit out of Fort Lauderdale, Florida, and was originally committed to play for Vanderbilt before announcing his intent to play for the Huskers in January of 2018, according to 247sports.com. The Husker’s face Illinois this Saturday, and the offense has the potential to have their biggest day yet. Illini defensive coordinator Hardy Nickerson resigned last week. The defense is having a disastrous season. Illinois has surrendered over 60 points to opponents twice this season, and on average, give up 36.9 points per game, 117th worst in the nation according to the NCAA. Illinois is ranked near dead last at 127th in the nation in total defense. Kickoff for Saturday’s game will take place at 11 A.M. The Huskers will wear alternate uniforms in honor of Veteran’s day.